Jim Allen was in Japan Jan. 9 to unveil what is expected to be a new Hard Rock integrated resort in the East Asian island country. 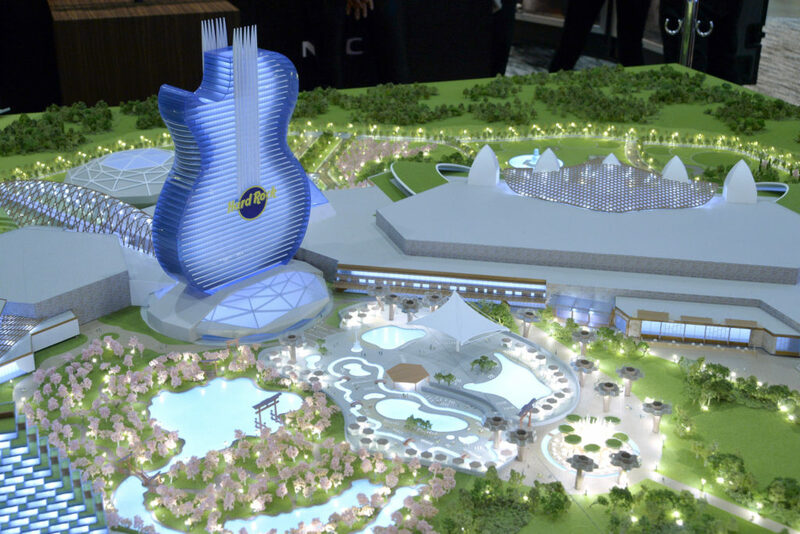 A full-scale model of the proposed entertainment resort was presented to the public at an event featuring Allen, the chairman and CEO of Hard Rock International (HRI), and Japanese officials. The Seminole Tribe of Florida is the parent entity of HRI. The occasion and venue for the unveiling was the Integrated Resort Showcase in Hokkaido, Japan’s second largest island. Along with the Hard Rock, the showcase and conference hosted several other major casino operators. The proposed Japanese resort would be located in the city of Tomakomai. While it would be the first of its kind in Japan, residents are at least somewhat familiar with the Hard Rock concept as there are currently six Hard Rock Cafés spread throughout the country. Officials have not yet released a timeline for construction of the proposed project. Officials say some of the key elements of the design would include monorail access from Chitose International Airport; a Four Seasons Resort; Hard Rock Live venue; multipurpose Broadway-style theater; state-of-the-art wellness center; more than 215,000 square feet of retail and dining space; and Hard Rock’s signature guitar-shaped hotel. Hard Rock is currently building its first guitar-shaped hotel concept at its resort in Hollywood, Florida. The 450-foot hotel is expected to be completed later this year, along with other additions and renovations to the site. In Japan, the project would also feature an authentic Ainu village experience – designed to raise awareness for the local indigenous Ainu people. New York Yankees: Expanding on its 12-year relationship with the Yankees, HRI would expand its “NYY Steak” concept and New York Yankee experience at the proposed site. NEC: HRI expects to use the latest in facial recognition and security services at the resort through the information and communications technology company. Music Rock-n-Roll Hall of Fame: Hard Rock will work to bring “praise and awareness” to the musical accomplishments of Japanese, Asian and global artists through a hall of fame concept. “With Hard Rock’s 35 years of business experience in the Japan market, we look forward to developing a premiere world-class Broadway theater in Hokkaido, so both Japanese and international visitors can enjoy a variety of popular theatrical shows throughout the year,” Robert Nederlander Jr., chairman and CEO of his family’s company said in a statement. Allen also used the occasion to announce Hard Rock’s participation in Hokkaido’s world-famous Sapporo Snow Festival, which began Jan. 30 and is celebrating its 70th anniversary. Hard Rock Japan constructed a massive snow sculpture, towering over four stories, showcasing famous Japanese animated rock star Hatsune Miku — a full 3D holographic ‘Vocaloid’ who appears in concerts all over the globe and is accompanied by a live band performing in sync to her performance. Allen also thanked Yoshikazu Nonomura, chairman and CEO of the Hokkaido Consadole Sapporo Professional Soccer Club, on Hard Rock’s recent sponsorship with them and to wish them a successful 2019 season. 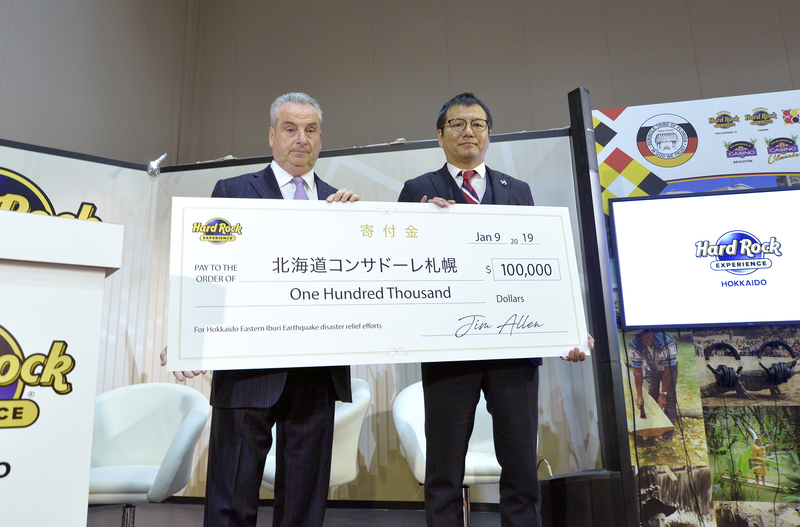 Allen presented Nonomura a check for $100,000 to the team’s Hokkaido Earthquake Charitable Relief Fund, which provides direct aid to Hokkaido residents who suffered losses in last September’s massive earthquake. Damon is a staff reporter for The Seminole Tribune. Prior to moving to Florida, he was a reporter and editor for print and digital publications in his home state of New Mexico. When Damon’s not working on a story, you’ll probably find him at a hot yoga class or splashing around on some South Florida beach. Send him an email at damonscott@semtribe.com.